Free Nights Offer – Stay for 3 nights and only pay for 2 nights. Please contact us for further details. Qasr Al Sarab Desert Resort by Anantara is the epitome of desert beauty. You are driven to the middle of the Liwa Desert and the endless majestic oasis is a dream. The Qasr al Sarab is rich in Arabian splendour, with unspoilt sand dunes and golden desert. The suites and villas are a mere extension of the Arabian culture that is on offer at the Qasr al Sarab. The suites are vast and amenities are pure luxury and you are spoilt from the moment you enter and poolside with swaying palm trees is a delight. Waking up to the expanse of the sun’s warmth spreading across the dunes is a view that dreams are made from. Spend your evenings going dune bashing or riding a camel or horse, land sailing and archery are only some of the activities available. The restaurants are authentic and cater for an international menu and if you wish to eat desserts under the stars in the desert, there is no better location than Qasr Al Sarab. Experience an unrivalled, flawless stay at Qasr Al Sarab and indulge yourself in the heavenly views; where golden sands meet the burnt orange of the sun setting and you become intoxicated with the oasis that surrounds you. Free Nights Offer – Stay for 3 nights and only pay for 2 nights. The Anantara Spa offers a range of revitalising treatments including Thai massage, aromatherapy and body scrubs, using the finest indigenous ingredients. Spa facilities include a Vichy shower, a Moroccan hammam with double-heated marble beds, steam rooms and jacuzzis. Qasr Al Sarab Desert Resort by Anantara is a palatial paradise for a honeymoon; beyond comparison. The tranquility and exclusivity afforded by the Qasr Al Sarab gives each couple the feeling that the desert is their paradise and the Qasr al Sarab their special secret. The azure skies and the golden sands are so vivid in colour; you wish the sun didn’t have to set. Many a moment can be spent watching the horizon, the sky illuminated with the sand dunes as the scenery lending itself so kindly. The spa is the perfect way to unwind after a day of walking in the desert and climbing a dune peak to watch the sun set. The cuisines available are mouth wateringly delicious and your haven is unmatched. Any honeymoon couple will be enamoured by the divine beauty that is Qasr Al Sarab. Dining in a desert is a surreal experience. 7 refined restaurants provide glorious delights and you can travel the whole world from the comfort of your dinner table. 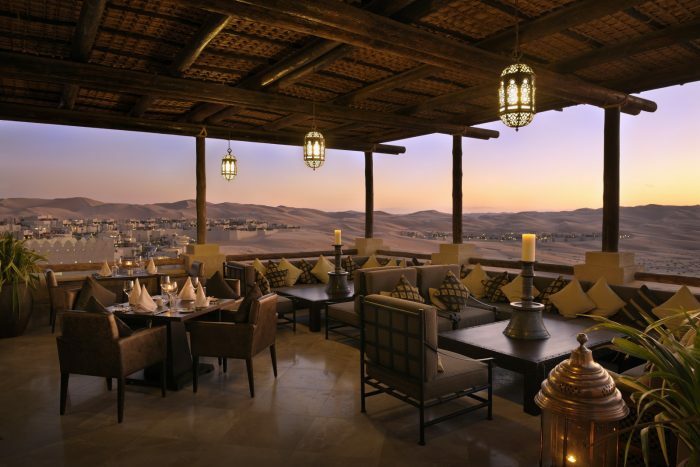 Suhail – A rooftop grill overlooking the desert is mind blowing. Lounge around and watch the sun set and starts twinkle. If you want to be alone, Suhail can be set up for private dining. Ghadeer – For Mediterranean delights by the pool and iced lollies this is the place to be. Villa BBQ – the joys of your own villa = the joys of a scrumptious BBQ by the pool with your own personal chef. Vibrantly coloured, pungent in taste, make the most of pool time.